Getting Cricky's Simply Sunday Challenge: Fantasy Land! It's time for another Simply Sunday Challenge over at Getting Cricky! This week is all about FANTASY LAND - princesses, fairies... anything you can FANTASIZE about, then it's all about this challenge! supplies: CS: Recollections except white (Neenah); DP: My Mind's Eye; stamp set: It's Valentines! (K Andrew Designs0; ink: Tuxedo Black (Memento); die cut princess: princess and dress cut at 3 1/4" (Once Upon a Princess - Cricut); clouds: large cloud punch (Fiskars); oval punch: EK Success for SU! Yay for using my Cricut again! I'm totally in love withe the Once Upon a Princess cartridge. There are SO many adorable images on it. I really need to sit down and play with it - M would love that! I used a sweet sentiment from the new K Andrew Designs It's Valentines! set. Super fun and verstatile - perfect for your upcoming Valentine's cards! 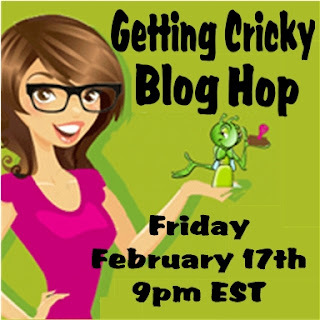 Getting Cricky's "Snow Much Fun" Blog Hop! Welcome to the "Snow Much Fun" Getting Cricky Blog Hop!! 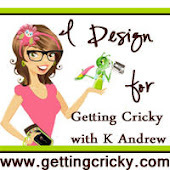 We're so happy you could join us for this month's Getting Cricky Design Team Blog Hop!! In addition to Kristal and the Senior Design Team, we look forward to introducing you to the rest of our NEW Junior Design Team (be sure to visit Kristal's Blog to see ALL of our "new additions"!!)... Each of us, along with our Special Guest - Patty from "Creative Diva", are so pleased to have you here with us!! Throughout the hop, you'll see NEW ideas for creating cards and projects with Kristal's stamps sets!! And here's my little card to share with you today! Sometimes I think the simplest sentiments can offer the biggest statements, don't you think? I just love this snowman saying "Brrr" from the Winter Wishes set! *lol* I think he's awfully cute, too - don't yout think? Hope you enjoyed the card I created for you today! Now that you're done here, be sure to head on over to KRISTAN'S BLOG to check out what she has in store for you! It's been a while since I've inked up my Hula Anya, but I thought it was appropriate - my family and I are headed to Hawaii next year! *happy dance* I'm super excited because this is our first BIG trip to Hawaii with the kids. We used to go almost every year before DH and I got married but after having kids... well, you know how that goes. Anyway, I wanted to create this card as my FIRST official member of the Getting Cricky Junior DT. I used the "aloha" sentiment from the Splashtastic Summer set - I'm TOTALLY in love with these sentiments! You ALL know how much I love collecting different "aloha" stamps - I just had to have this one in my collection too! AND another great thing about these sets? Kristal donates a portion of each sale to charity! Gotta love that! Thank's for stopping by! Have a wonderful weekend! 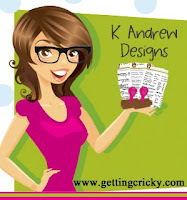 I'm SUPER excited to get to with some awesome K Andrew Design Stamps and showing you what I can do with them - Yup, you all KNOW that I love me some GOOD SENTIMENT STAMPS! Best of all, that means I'll have more crafty posts to share with you during the week - YAY!